it is a slow growing, sometimes shiny or “pearly” looking lesion , which often does not give any symptoms and though it can grow where it is it does to spread to other parts of the body. It may bleed easily after minor trauma. is most commonly a more rapidly growing lesion , and might be ulcerated , tender, hard and firm . 5% of these skin cancers can spread elsewhere in the body. These are most often pigmented ( dark coloured) and may or may not arise from an existing mole. A mole that looks different from your other moles or feels itchy, hard, bumpy, swollen, or tender to the touch. Because most melanoma cells produce melanin ( a dark pigment) melanoma tumors are often brown or black in colour. However, they can also be flesh-colored, bluish, or pink in nature. 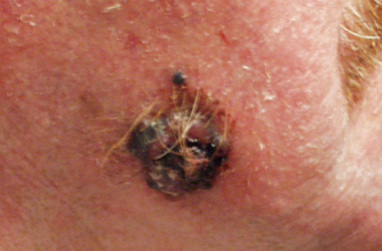 Melanoma can also appear on the body as a “new” mole or pigmented lesion. It can spread to other parts of the body through the lymph system, or through the bloodstream and is best treated when it is diagnosed early. For this reason consulting your doctor early if you have any concerns is of paramount importance. To detect melanoma early, it is important to examine your skin on a regular basis, and become familiar with your moles and other skin lesions, in order to notice if any changes occur. Certain types of moles (also called nevi) may be at higher risk for changing into malignant melanoma. Moles that are present at birth (congenital nevi, particularly when large in size), and atypical moles (dysplastic nevi), may have a greater chance of becoming malignant. However, most melanomas do not arise from a pre-existing mole (common, congenital or dysplastic types), and so removing many benign appearing moles en mass is not necessary. Recognising changes in your moles, by following something called the ABCDE Chart, is helpful in detecting melanoma at its earlier, more curable stages. It is important to understand that “E” stands for an evolving lesion i.e. one that is different in appearance compared to other moles or changing in size, shape, or color, over time. As melanoma is widely variable, some melanomas may show all of the ABCDE characteristics, while others may show few or even none of these. 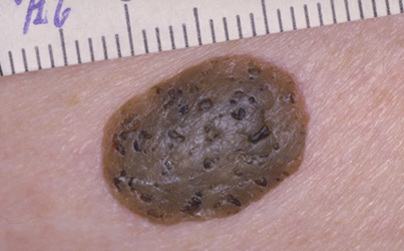 A lesion that looks odd or nothing like any other moles should also raise suspicion. To be safe if you are not sure if a lesion is anything to worry about consult your doctor promptly.